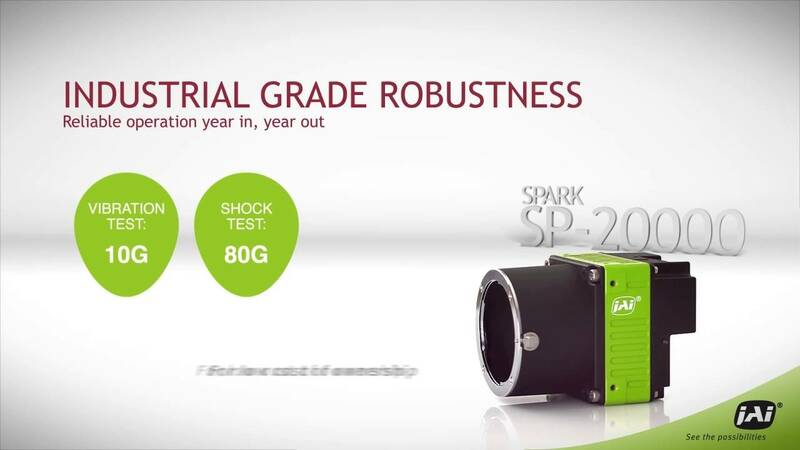 Four new additions to the JAI Spark Series of industrial cameras combine 12 megapixel resolution with the full 189 fps frame rate of the CMOSIS CMV-12000 CMOS sensor. These ultra high performance colour and monochrome cameras are designed for wide range of high speed inspection, event capture and metrology applications. The huge quantities of data produced (19 gigabits per second) are transferred from the camera using a high speed CoaXPress 4-connector interface. Two thermal management options offer a choice of operating temperature ranges of -5 °C to +30 °C or -5 °C to +45 °C. Both variants feature a heat dissipating housing and internal temperature sensors, while the extended temperature range versions benefit from an additional cooling fan. The four models in the range comprise both colour and monochrome versions in the two temperature range variants. This provides the flexibility to handle high speed applications covering a wide range of industrial environments in production quality control in the pharmaceutical, medical device manufacture, semiconductor and PCB, packaging and print, and solar and LCD panel industries. The rugged design provides further environmental protection including an 80 G shock rating and 10 G vibration rating that help the cameras to achieve a mean-time-between-failure (MTBF) specification of over 200,000 hours. This meets the highest industrial standards for reliability and durability, leading to low cost of ownership, and all in a housing with a small form factor (60 x 60 x 127.5 mm) and a weight of only 510 grams. This is one of the smallest and lightest 12 megapixel CoaXPress cameras currently available. All four models include an extensive range of pre-processing functions to simplify operation. These include automatic level control which combines auto gain and auto shutter capabilities for optimum exposure. A unique multi-region of interest function allows flexible image readout from smaller regions of the sensor at even higher frame rates allowing even faster inspection processes. Monochrome versions also feature a high dynamic range function providing up to 90 dB dynamic range for imaging of scenes that contain both very bright and very dark components, and 1x2, 2x1 and 2x2 binning for applications where the signal-to-noise needs to be improved.